The Janus fund manager argues Donald Trump’s policies aren’t much help for working-class supporters. Count me among them, yet in voting to deny Hillary Clinton the Henhouse, they “unwittingly” (lack of wit), let Donald Trump sneak in the side door. His tenure will be a short four years but is likely to be a damaging one for jobless and low-wage American voters. They were the force for Trump’s flipping the Midwest into a Republican Electoral College victory. But while the Fox promised jobs and to make America great again, his policies of greater defense and infrastructure spending combined with lower corporate taxes to invigorate the private sector continue to favor capital versus labor, markets versus wages, and is a continuation of the status quo. For example, Republican pleas for tax reform are centered around the argument that America has one of the highest corporate tax rates in the world at 35%. Not so. Of the S&P 500’s largest 50 corporations, the average tax rate (including state, local and foreign regulations) is 24%. U.S. corporations rank among the world’s most lightly, as opposed to heavily, taxed. Trump policies also appear to favor the repatriation of trillions of dollars of foreign profits at extremely low cost under the logic that the money will be spent for investment here in the U.S. Doubtful. The last time such a “pardon” was put into law in 2004, no noticeable pickup in investment took place. Of the $362 billion that earned a “tax holiday”, most went to dividends, corporate bonuses, and stock buybacks. Apple or any other large U.S. corporation can borrow the money they need here in the U.S. at historically low interest rates to fund investment. A few have, but over $500 billion annually in recent years has gone to the repurchase of corporate stock and the increase of earnings per share, instead of earnings and GDP growth. Why would they need to repatriate anything for investment in the real economy? But could a Clinton Administration have done much better? Probably not. Both the Clinton Democrats and almost all Republicans represent the corporate status quo that favors markets versus wages; Wall Street versus Main Street. That’s why the American public and indeed global citizens will continually take a wrong turn in their efforts to neuter the establishment and to regain several decades’ lost momentum in real wages versus real profits. Neither party as they now stand has bold policies beyond the reach of K Street Lobbyists. To my mind, there are better solutions than either party’s election platform, such as a Keynesian/FDR job corps or a Kennedyesque AmeriCorps that puts people to work helping other people. Such programs were never emphasized by either candidate. Let’s supplement welfare with a patriotic “Help America” jobs program, even if government organized. Would it be as efficient as a corporate-led effort? Of course not, but corporations are fighting structural headwinds, such as demographic aging, technological displacement of jobs (robotization), deglobalization, and overleveraged balance sheets. They focus on the bottom line as opposed to the public welfare. Government must step in, not by reducing taxes, which will only increase profits at the expense of labor, but by being the employer of last resort in hopefully a productive way. Populism is on the march and a Trump victory will do little to halt its advance in future decades. If anything, it is demographically baked in the cake. Investors, as The Economist astutely pointed out, face a possible no-win situation. Unless the worker’s share of GDP reverses its downward trend, and capital’s share peaks, then populists worldwide will reject establishment parties in almost every future election – initiating in some cases growth-negative policies revolving around trade, immigration, and yes, in Trump’s case, lower taxation that may lower GDP growth, not raise it. Global populism is the wave of the future, but it has taken a wrong turn in America. Investors must drive with caution, understanding that higher deficits resulting from lower taxes raise interest rates and inflation, which in turn have the potential to produce lower earnings and P/E ratios. There is no new Trump bull market in the offing. Be satisfied with 3-5% globally diversified returns. The Wall Street, finance-led hegemon is fading. The Populist sunrise has barely broken the horizon. Recent votes in the U.S. and U.K. reveal nationalism is evolving into different forms. We take for granted today how remarkable the modern nation is. Countries like the United States, the United Kingdom, France and Russia contain multitudes of different types of individuals, the vast majority of whom are relatively unaffected by foreign policy. Hans Morgenthau pointed out that nationalism drives these disparate individuals to experience the power and policies of their nations as their own, and that aggressive nationalism is often a result of economic or political stress. This is the great paradox of nationalism. It supplanted tribalism, faith and monarchy as the organizing principle of the international order in the 19th and 20th centuries, and it is the glue that binds diverse groups of individuals together into states. But it also means defining who isn’t a part of the nation, which can unbind both society and broader international institutions. Today, nationalism in certain urban areas comes from a different source than in suburban and rural areas. The urban-rural split is not a novel discovery, but it has become more pronounced as a result of resurging nationalism. For example, when people in the U.K. voted on whether to remain in the European Union, Wales and England voted to leave. 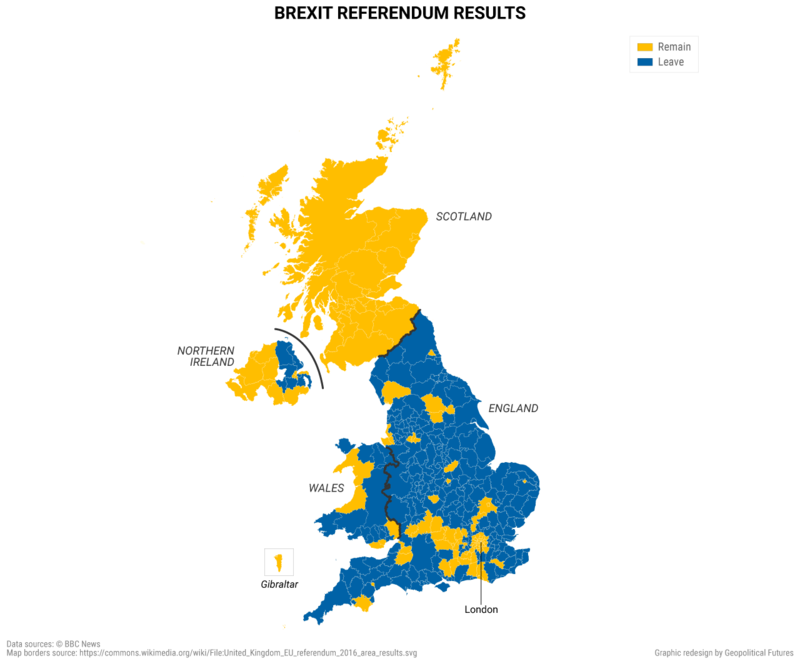 Scotland, Northern Ireland and the City of London voted to remain. The result of the referendum in London is the most striking. Scotland and Northern Ireland have been independent at various points in history, but London has been the capital of what is today England for almost a millennium. Of all Londoners, 60 percent voted to remain in the EU, but the majority of English voters wanted to leave. Some suggested (maybe jokingly) that, just as Scotland and Northern Ireland have done, London should explore whether it can remain within the EU and leave the rest of England behind. The results in the recent U.S. presidential election are even more striking. Donald Trump is often described as a nationalist candidate and in many respects the label fits. His slogan, “Make America Great Again,” to him meant getting rid of those who aren’t American (illegal immigrants) and instituting policies (repealing NAFTA, raising tariffs) that will be best for the American worker and not for the global economy. Americans’ response to Trump’s campaign revealed a distinct urban-rural divide, with New York City being a particularly salient example. Hillary Clinton won the five boroughs of New York City by an 81-19 percent margin. Take the votes of the five boroughs away, and Clinton wouldn’t have even carried New York state. It was not a coincidence that New York City became the epicenter of anti-Trump protests. It was precisely because New Yorkers could not believe they lived in a country where Trump could win a presidential election. London and New York City are interesting case studies in how much cities can differ from the rest of the country. In London, for example, the median average salary for a resident in 2015 was nearly double that of the rest of the U.K. – 48,023 pounds ($59,800) compared to 27,531 pounds. This is in part because of a higher cost of living of course, but consider all the other ways in which London differs from neighboring counties. According to a report by consulting firm McKinsey, London’s GDP grew 27 percent faster than that of the U.K. as a whole. According to the U.K.’s last census in 2011, 37 percent of all London residents were not born in the United Kingdom. For the rest of the U.K., that figure was only 9 percent. London’s population is seven times bigger than any other British city and accounts for almost 15 percent of Britain’s total population. In New York City and the U.S., the divide is just as conspicuous. According to the U.S. Census Bureau, the median income in the U.S. in 2014 was $51,939. In Manhattan, a borough of New York City, it was $69,569 and in nearby Westchester county, where the Clintons have a home and which is much more a part of New York City than it is part of the rest of the state, it was $81,946. New York City’s population is also disproportionately large, double the size of any other major U.S. city, and makes up roughly 40 percent of New York state. Compared to rural areas of the U.S., New York City is also markedly more diverse. According to New York City’s Department of City Planning, in 2011, 37 percent of all New Yorkers were foreign born. This is in stark contrast to a state like Iowa, which Barack Obama won in 2006 and 2012 but flipped to Trump in 2016. A study published in 2014 by Iowa State University used data from three different time periods from over 99 Iowan towns to put together a composite image of the typical Iowan small town. The population of this fictional town in 2013 was 1,977 people, 92 percent of whom were white. The needs of city dwellers have always differed from those who live in rural areas, just as the interests of people on the coast differ from those of people in the interior. But along with nationalism and the urban-rural divide, there is a rise in connectivity between megacities, where residents increasingly have more in common with each other than with other citizens within their countries. And because of advances in communication and technology, these city dwellers can freely communicate with and travel to visit their urban comrades in other countries more easily than at any other moment in human history. They view the values of their fellow citizens – based in nationalism tied to the state partly because they are more isolated and more dependent on the state than the city dweller – as provincial. At times, they prefer the values they share with people who live in cities – even if they are citizens of a different country. As Londoners joke that they want to remain in the EU even after Brexit and New Yorkers continue their protests outside Trump Tower with chants of “not my president,” they are expressing a kind of solidarity with each other. This is not to say that London and New York City are about to secede from their respective countries and become independent city-states; the situation is not nearly so dire. But cities are now developing their own form of nationalism around shared urban values, while nationalism based on the nation-state lives on in non-urban areas. The average New Yorker doesn’t see how important and seductive Trump’s promise of restoring America’s greatness is to someone living in the Rust Belt or the rural South, where jobs are leaving, times are hard and on top of it all America seems weaker than ever. The average Londoner doesn’t see how important the U.K.’s sovereignty is to the average British citizen, who might not care about passport-free travel because he can’t afford a holiday in Italy anyways. As a result, those who live in cities begin to feel as disconnected from the body politic as the body politic does from the political and financial elites. 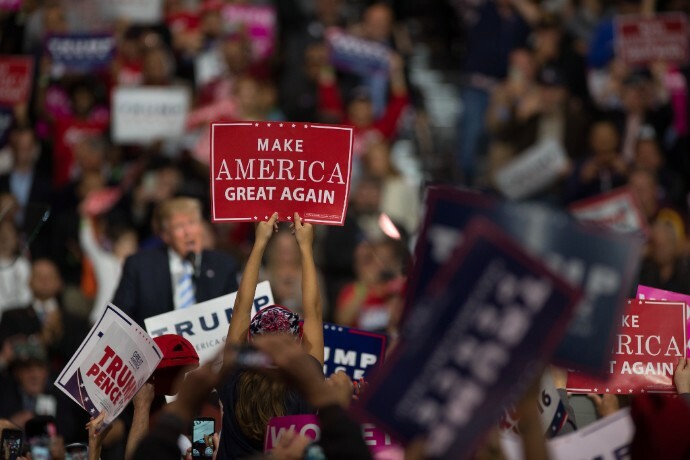 And in cities, which are diverse and often home to many immigrants, nationalism is expressed not in full-throated pledges of allegiance to the state, but rather by a reversion to the other national identities they carry within them. They feel less American, but more Jewish, Mexican, black, Dominican or whatever other identities are an important part of their individual lives. They feel less British, but more Scottish, Irish, Ulster or even European, whatever that means to them. Still others see themselves as part of a more global community, united more at times by a particular set of cherished values than by loyalty to their country, and take comfort in knowing that their worldviews are shared by those in other cities. All of these reactions are also forms of nationalism, though many in the cities don’t realize it, as they think of nationalism as that visceral and at times even illiberal reaction that “others” have. But there’s no way to escape nationalism in uncertain times such as these, and as nationalist sentiments increase, they will continue to bring people together and split them apart. In just the last six months, the world has had two “black swan” events. These are rare events that very few people see coming. When these kinds of events happen, the market reaction can be dramatic. Heading into the year, most people thought Great Britain would stay in the European Union (EU). When it voted to leave on June 23, investors from London to Tokyo were shocked. A panic followed that knocked more than $3 trillion from the global stock market in two days. Last week, investors were caught off guard again. Most people thought Hillary would run away with the election. When Trump pulled off the “unthinkable,” no one knew what to do. At first, U.S. stocks plunged. That was supposed to happen if Trump won. But they quickly changed course. Over the last few days, U.S. stocks have broken out to record highs. Casey Research founder Doug Casey actually predicted that Trump would win months ago. He even made a couple side bets on the outcome. We’re telling you this because it shows that you can predict events most people can't ever anticipate. And if you’re right, you can make a lot of money. If this event goes the way we expect, millions of people could see their life savings go up in smoke. The world’s biggest economy could start to unravel. You might find this hard to believe. But as you’re about to see, we aren’t the only ones worried about this. The good news is that you don’t have to be a victim. Today, we’ll show you how to turn this coming crisis into big returns. You see, working-class people in England and the United States are fed up right now. They feel like the system is “rigged”…that “the establishment” doesn’t care about them. President Barack Obama said that fear of globalization and suspicion of government institutions and elites powered both the U.K.’s vote to exit the European Union and Donald Trump’s election as the next U.S. president. “Did I recognize there was anger and frustration in the American population? Of course I did,” Obama said in answer to a question about whether he saw parallels between Trump’s election and Brexit. After all, the economy has grown at an annualized rate of just 2.1% since 2009. This makes the current “recovery” the slowest since World War II. What’s worse, the real median household income has fallen from $57,795 in 2007 to $55,218 today. In other words, millions of Americans are now worse off than they were before the last financial crisis. Meanwhile, the S&P 500 has more than tripled in value over the same period. This disconnect between the stock market and the “real” economy is why so many people think “the system” isn’t working. And it’s why a lot of people voted for Trump. Trump’s an outsider. He’s never held public office. He says whatever the hell he wants. And he’s promised to shake things up. Italians are just as fed up with their government. Italy has had no productive growth since 1999. Real GDP per person is smaller than it was at the turn of the century. That’s almost two decades of economic stagnation. By any measure, the Italian economy is in a deep depression. And there’s no end in sight. In fact, things will probably get much worse. This mood has given rise to a populist, anti-establishment political group known as the Five Star Movement (M5S). M5S blames Italy’s chronic lack of growth on the euro currency. A large plurality of Italians agrees. M5S has promised to hold a vote to leave the euro and reinstate Italy’s old currency, the lira, as soon as it’s in power. And that could be very soon. Of course, M5S will have to assume power before Italy can drop the euro. But that could happen as soon as next month. In effect, a “Yes” vote is a vote of approval for Renzi’s government. A “No” vote is a chance for the average Italian to give the finger to EU bureaucrats in Brussels. Given the intense anger Italians feel right now, it’s very likely they’ll do just that. According to the latest polls, most Italians plan to vote “No.” If this happens, Renzi, Italy’s current prime minister, has promised to step down. That would make it much easier for M5S to rise to power. A defeat for Mr. Renzi would lead to a period of political instability. Mr. Renzi could follow through on a pledge to resign or be forced into a new coalition until elections are held in 2018. Either way, markets would interpret his defeat as proof that Rome is incapable of reform, raising doubts about Italy’s ability ever to deliver the kind of growth needed to put its debt burden of 135% of gross domestic product on a sustainable footing. That in turn would make investors even more reluctant to put capital into the Italian banking system, forcing banks to impose losses on bondholders, many of whom are ordinary savers. That would create a spectacular political backlash that could bring the deeply euroskeptic, antiestablishment 5 Star Movement to power in 2018, putting Italy’s euro membership in doubt. But the Italian referendum (or "Quitaly," as some are calling it) could do far more damage than Brexit. You see, unlike the U.K., Italy actually uses the euro. If it leaves the EU, Europeans could lose “faith” in the euro…and that’s all a paper currency like the euro has. The bottom line is this: the entire EU project may very well die in Italy later this year. That would undoubtedly trigger a stock market crash of historical proportions. And that’s why I think it’s very important to keep a close eye on the Achilles’ heel of the EU… Italy. An Italian exit from the single currency would trigger the total collapse of the eurozone within a very short period. It would probably lead to the most violent economic shock in history, dwarfing the Lehman Brothers bankruptcy in 2008 and the 1929 Wall Street crash. Even if the Financial Times is only half right, we could be looking at a stock market crash of historic proportions. In August, Nick recommended that his readers short the euro. Shorting is when you bet that a stock, bond, or currency will fall. If it does, you make money. A lot of people think shorting is something only the "pros” do. But Nick found a way to short the euro that’s as easy as buying a share of McDonald’s (MCD). In just three months, Nick’s readers are up 12% on this trade. But they could see much bigger gains if Nick’s right about the upcoming Italian referendum vote. And remember, this vote will take place less than three weeks from now. 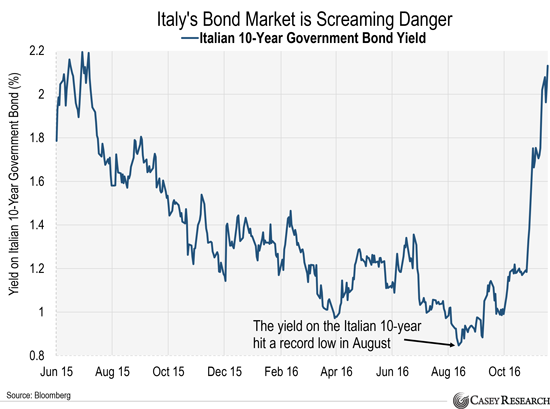 Italy’s bond market is screaming "danger." Today’s chart shows the yield for the Italian 10-year government bond since July 2015. Remember, a bond's yield rises as its price falls. As you can see, the yield for the Italian 10-year government bond hit an all-time low of 1.04% in early August. Since then, it’s surged to 2.12%. Put another way, it's more than doubled in only three months. This is a serious red flag. It tells us investors are very nervous about Italy. And they have every reason to be. If Italy’s upcoming referendum goes the way we expect, Italy’s bond market could implode. And that could mark the beginning of the end for the euro. Nick’s so convinced this will happen that he sent an alert to his readers on Tuesday telling them to short Italian bonds. In other words, he doubled down on his bet against Italy. Demonetization in India: Who Will Pay the Price? The ‘demon’ in demonetization is in the beginning. On November 8, Indian Prime Minister Narendra Modi announced in a broadcast to the nation that Rs500 ($7.40) and Rs1,000 currency notes would no longer be recognized legally as currency. “Great,” said Corporate India, economic commentators, foreign investors, international think tanks and global rating agencies. “Masterstroke,” echoed the Confederation of Indian Industry (CII). The aim behind the government’s action was to combat tax cheating, counterfeiting and corruption. Eliminating large denominations makes it harder to hide large amounts of cash. “This announcement appears to be the most significant change made by the Modi government to date,” says Girish Vanvari, partner and head (tax), KPMG in India. “Its impact could be even bigger than GST (the Goods and Services Tax which is still running the gauntlet of politicians).” Adds a report by Crisil, a global S&P company: “Tuesday’s move could change the face of the Indian economy, improve the government’s fiscal position and tax compliance. The demon started surfacing. India is a cash economy; almost everyone keeps a few Rs500 notes as a nest egg. Lines began forming in front of ATMs and banks which could exchange old notes for new. A mere exchange — a new Rs500 for an old Rs500 — was not enough; there was also a limit imposed on how much one could exchange or withdraw from their accounts. In some cases, there were altercations as people waited for hours. Gas pumps and hospitals (which were allowed to accept old notes) saw a boom in business. People also wanted smaller currency notes to serve their daily needs. A loaf of bread costs Rs25. No shopkeeper would give change for Rs500. The need for the government to keep the move a secret — so that tax evaders wouldn’t be alerted before the demonetization took place — affected preparedness. Jaitley admits it will take two-three weeks to reconfigure the ATMs to handle the newer and larger notes. A Rs2,000 note has also been introduced. Modi has suggested it will take 50 days (until the end of 2016) for people to adjust to the change. Meanwhile, expensive marriages were called off. Deaths cannot be called off so easily — but the government catered to that by allowing payment at crematoria in old currency. The role of cash and high-value bank notes in the Indian economy cannot be understated. According to Reserve Bank of India (RBI) figures, as of March 2016 currency in circulation amounted to Rs16,415 billion. Of this, Rs500 notes accounted for 47.8% in value and Rs1,000 notes another 38.6%. Together, they were more than 86% of the value of the notes in circulation. That’s a whopping amount to be frozen in one fell swoop. Understandably, banks and ATMs can do only so much. There’s a lot of tinkering to be done with limits and schedules of the exchange outlets and bodies authorized to take payments in old bills — state-owned electricity suppliers, for instance. To the credit of the government, this is being done on a continuous basis. But there are questions — especially from political parties — over their effectiveness. “There are serious negative externalities that have been created over time,” says Wharton’s Singh. Singh offers a hypothetical example. “Imagine that I own some land in Bangalore. I want to sell the land, and I have no interest in short-circuiting the law. I want to pay all my taxes in India and elsewhere. However, I am told that the common practice is that some significant percentage of such a transaction will involve black money, maybe as much as 40%. If I want an all-white transaction, the selling price will be much lower. Imagine my dismay at learning this. There are many benefits that will come with the government’s move, Singh notes. “The size of the formal economy which the government can manage though its policy actions will increase, perhaps significantly. This step may have positive implications for tax revenues longer term. There may even be influences on the growth rate of GDP. However, for sectors like real estate, a notorious hotbed for black money transactions, there will likely be disinflationary pressures short term, with prices being pushed downward before they stabilize longer term.” Real estate shares have plunged, in some cases by more than 30%. But the stock market may be the wrong place to look for signs of how the demonetization move has been received, because it coincided with Donald Trump’s victory in the U.S. presidential election. (“America counts votes as India counts notes,” headlined The Times of India.) That was a global dampener. The Bombay Stock Exchange Sensitive Index (Sensex) fell 1,000 points on Wednesday morning before ending up just 250 points down. The next day saw a 500 point rally followed by a 700-point plunge. The first two trading days of the next week saw another 1,000-point (nearly 4%) fall. 1948-2008.” The report estimates India lost a total of $213 billion due to illicit flows in that period. “The total value of illicit assets held abroad represents about 72% of the size of India’s underground economy which has been estimated at 50% of India’s GDP (or about $640 billion at end 2008),” says the report. “Demonetization will place a temporary brake on illegal transactions in cash until operators figure out alternative ways of financing such transactions,” continues Kar. “The U.S. dollar and pound sterling obtained from the local black markets is one such way. 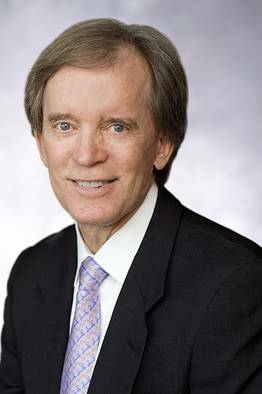 This shift will drive up the dollar in the black market and increase the spread with the official rate, which will in turn put pressure on the official rate to depreciate. The Supreme Court of India, while refusing to stay the demonetization move, has asked the Modi government to file an affidavit detailing the steps being taken to ease the inconvenience to the general public. For Modi, this is work in progress. In his speech to the nation, he outlined what his government has done so far. A law was passed in 2015 for disclosure of foreign black money. Agreements with many countries, including the U.S., have been made to add provisions for sharing banking information. A strict law has come into force from August 2016 to curb benami transactions, or the purchase of property and deals using fictitious names — a way of deploying black money earned through corruption. A scheme was introduced for declaring black money after paying a stiff penalty. And arching over it all was the Prime Minister’s Jan Dhan Yojana, which aimed at financial inclusion for the whole country. Launched in August 2014, it has managed to add 250 million bank accounts through November 2016. Demonetization, then, was inevitable; the only surprise being when.